. User expectations for application performance are already high and applications with poor performance risk losing users. For example, 25% of users abandon a web page if its load time is more than four seconds and 86% of users delete an application after poor performance. Ask any developer who has experienced the stress of diagnosing performance issues in production and you will find that it is extremely difficult to isolate the root cause of poor performance when it happens. This is especially true when the sluggish behavior is only seen by a small fraction of your users. We introduced Google Cloud Trace at Google I/O 2014 and gave an in-depth talk and demo at Google Cloud Platform Live back in November. Today, we’re announcing the beta release of Google Cloud Trace which is now available to all Google Cloud Platform customers. 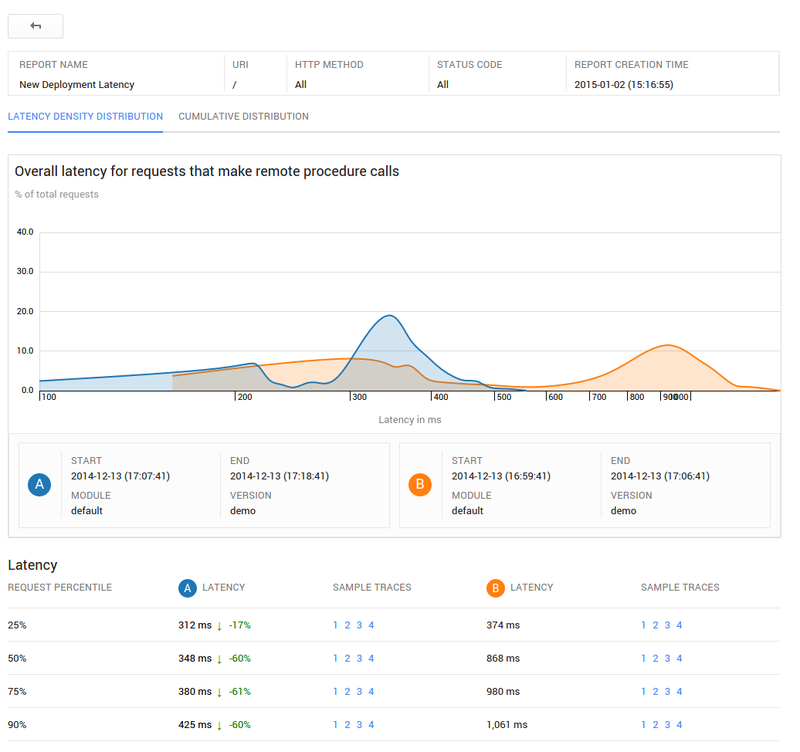 With Google Cloud Trace, you can diagnose performance issues in your production application by quickly finding the traces for slow requests and viewing a detailed report of where time is spent in your application while processing these requests. Its trace analysis feature allows you to see the latency distribution for your application, and find the painfully slow requests that may be affecting only a small number of your users. You can also use the trace analysis feature to check if the performance of a new release is better than the previous release. 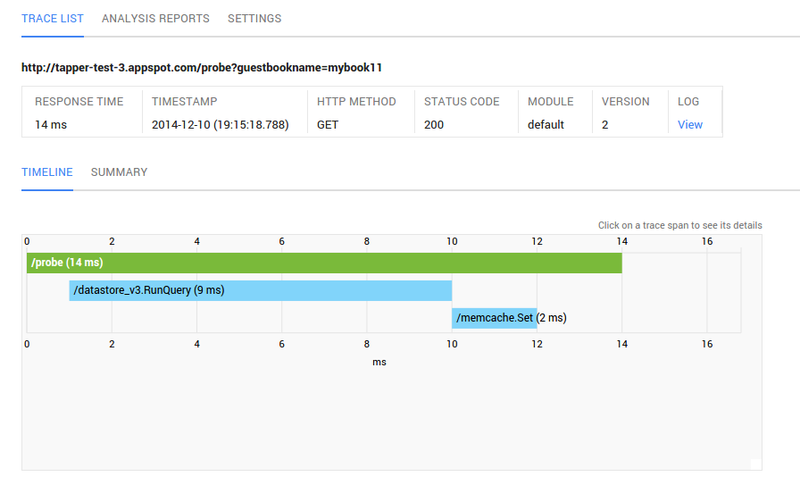 If you look at the screenshots below, you can get a feel for the type of insight Cloud Trace provides. Figure 1 shows the breakdown of a single request to an application, and where time was spent in processing the request. 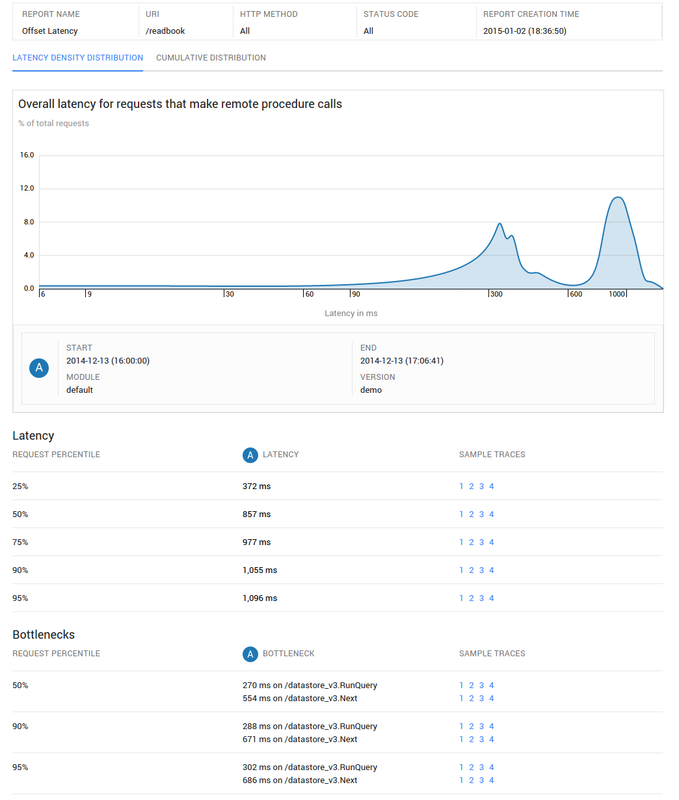 Cloud Trace can analyze a set of requests to show their latency distribution, percentile latency values with sample traces, and the remote procedure calls that are significant latency bottlenecks. Cloud Trace also allows you to compare the latency profiles for an application’s requests from before and after a change is made, such as rolling out a patch. Figure 3 shows the comparison between the before and after requests. To get started with using Cloud Trace for your project, visit your project’s home page in the Google Developers Console, select Monitoring > Traces in the navigation panel, click on the Settings tab, and set Traces to On. Cloud Trace has very little overhead, so you can safely leave traces enabled for your application without worrying about performance impact. Once traces are enabled for your application, Cloud Trace will start tracing requests received by your application, and continue to do so as you deploy new versions of your application. Take a look at our Google Cloud Platform Live talk, check out our documentation, and try it yourself -- there’s no set up required. All you need is an application running on App Engine or a Managed VM. We look forward to receiving your direct feedback. Here at Google, we understand the importance of having applications run at optimal speed. Awesome performance of your application is critical for end user satisfaction and retention. User expectations for application performance are already high and applications with poor performance risk losing users. For example, 25% of users abandon a web page if its load time is more than four seconds and 86% of users delete an application after poor performance. Ask any developer who has experienced the stress of diagnosing performance issues in production and you will find that it is extremely difficult to isolate the root cause of poor performance when it happens. This is especially true when the sluggish behavior is only seen by a small fraction of your users.